AIM RevitaFem is a natural, botanical supplement that has been formulated to support physical and emotional balance during menopause and provide relief of the discomforts that can be associated with this most important life passage. It contains herbal sources of phytoestrogens and supporting herbs, each addressing specific issues that occur in the female body during this transitional period in life. Phytoestrogens are simply plant estrogens with mild estrogenic effects that can modulate out-of-balance estrogen levels. If your estrogen levels are too low, phytoestrogens will act as substitutes for your fluctuating hormones; if your estrogen levels are too high, phytoestrogens will block overstimulated receptor cells. Because plant sources have varying amounts and kinds of phytoestrogens, multiple sources are used in this product to enhance the efficacy of AIM RevitaFem. This new, comprehensive formula con- tains eight botanical ingredients. All help to regulate and balance body systems. The combination of botanicals in RevitaFem provides a synergistic powerhouse in the support of menopause management. We are excited about the results women are seeing with RevitaFem. If you are not 100% satisfied please take advantage of our 100% money back guarantee on the purchase price (about USA$13 and CAN$20). Please note that this formula is not recommended for use during pregnancy and lactation. If you experience long and heavy periods, consult a health care practitioner before use. Suggested use is 1 capsule 2 times per day and is best taken with meals. 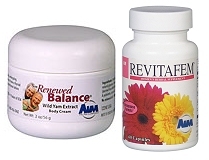 RevitaFem works well with Renewed Balance Natural Progesterone Cream. Bladder or Urinary Track Infections? Try Cranverry !